More than 60 more acts for the 2019 Live At Leeds festival are set to be revealed at a special launch show next week. In proud association with Independent Venue Week, the ‘Exclusive Line Up Reveal’ event will take place at Leeds’ iconic indie hub The Wardrobe next Thursday (January 31) and will see the festival announce its 2019 programme to a live audience from 6pm that evening. In honour of the occasion, this official launch show will also preview three of the many promising local acts set to appear at Live At Leeds 2019 this May, with exhilarating live performances on the night. Topping the bill are Wakefield’s Skinny Living, a band that started out busking on the streets of Yorkshire, yet whose assured soulful indie has seen them score a recent signing deal with major label Sony Music. Having sold out numerous shows across the region already and performed a headline gig at Stylus, in Leeds, the way these lads are heading there’s little chance you’ll see them in a venue this cosy again any time soon. Hull band The Hubbards will support with a set of their infectious indie rock. Featured on some of Spotify’s biggest playlists, the four-piece have built-up a strong following across Yorkshire and beyond already and kick-started the new year named as an ‘artist to watch for 2019’ by BBC Introducing / Radio 1. 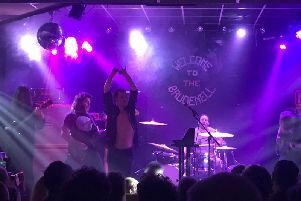 And, sure to captivate with their muscular, riff-packed indie-rock, Leeds’ own Ormstons will get the evening’s proceedings under way with a bang to a hometown crowd. Tickets are a steal at just £2 and extremely limited, so be quick to avoid any disappointment. Live At Leeds 2019 is a multi-venue festival taking place in Leeds city centre on May 4 with artists previously announced including Sundara Karma, Tom Grennan, Dream Wife, Goat Girl, Black Honey, Fuzzy Sun, Zuzu, Saltwater Sun, Squid, Sports Team, Big Society, Heavy Lungs, Retro Video Club and No Hot Ashes.